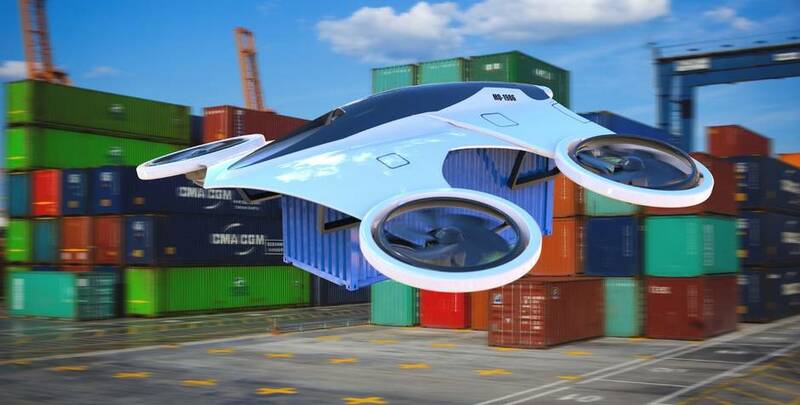 The Modal is a logistics drone designed to move empty shipping containers by lifting them in the air and carrying them over short distances. It could be used to move containers in ports or position container homes on places that are hard for a truck to reach. Last year I worked on a mobile incubator concept, so I started wondering how to move those huge containers with trucks and cranes in remote locations. I first started developing a VTOL aircraft concept called the Shango, and shortly after a retired RCAF pilot named Tom Hobbs contacted me to work on a new, improved concept. We drifted from that concept and ended up with the Modal. 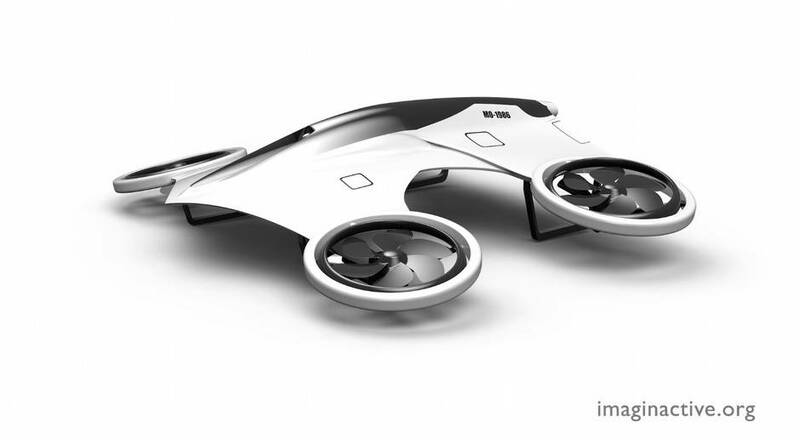 The Modal would have multiple propellers and a shape similar to a quadcopter or a hexacopter. A clamping system could be used to attach the vehicle to 20 or 40-foot long intermodal containers. A 2000-horsepower Pratt & Whitney PW100TS turboshaft engine would deliver power to the four propellers. The frame of this vehicle would need to be as light and robust as possible to avoid carrying useless weight. Landing pads could be deployed for landings without any container attached. 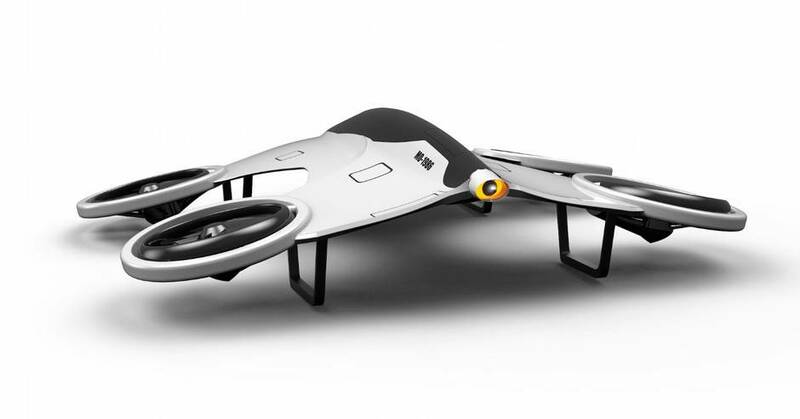 It could be controlled remotely by an operator to reduce its size and weight, or a manned version could be developed. An intermodal container weights between 5,000 and 8,000 pounds depending on its size. 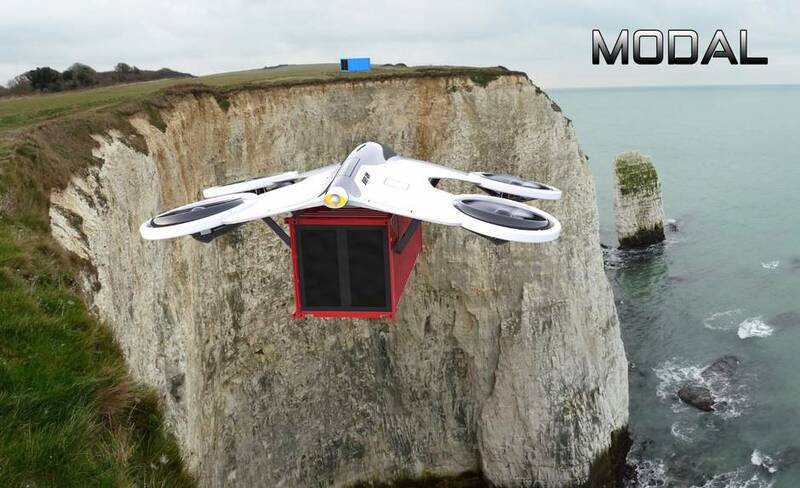 The Modal would be able to use the ground effect to lift them up and transport them over distances of a few miles. The shape of the aircraft could be altered to optimize lift. Additional jet thrusters could be used to provide a boost to the aircraft. Lighter boxes made of composite could also be developed to reduce fuel consumption or increase the vehicle’s autonomy. The Modal could be used to carry empty containers from a flatbed truck to a secluded lot in order to build a small container-sized house. It could also be used to manage empty containers on construction sites or ports and carry out various types of missions. The Modal concept could be developed as multi-mission drone, but it would need to cost a lot less than a Bell Huey II to do this job (it has a 4,873lb payload) and would definitely need to be certified and reliable. I would like to thank Abhishek Roy, who created the images for the Modal concept. Roy is the owner of Lunatic Koncepts, a design business in India. His team also created the VR controlled Antro and the Subrocket racing car.